In some situations, running active full backups periodically may not be an option. Active full backups are resource-intensive and consume considerable amount of network bandwidth. As an alternative, you can create synthetic full backups. Synthetic full backup functionality is available only in Workstation and Server editions of Veeam Agent for Microsoft Windows. When you perform active full backup, Veeam Agent for Microsoft Windows reads backed up data, compresses it and copies it to the target location. When you perform synthetic full backup, Veeam Agent for Microsoft Windows does not retrieve data from the Veeam Agent computer. Instead, it synthesizes a full backup from data you already have on the target location. Veeam Agent for Microsoft Windows accesses the previous full backup file and a chain of subsequent incremental backup files in the backup chain, consolidates data from these files and writes consolidated data into a new full backup file. As a result, the created synthetic full backup file contains the same data you would have if you created an active full backup. The synthetic full backup does not use network resources: it is created from backup files you already have on the target location. The synthetic full backup produces less load on the production environment: it is synthesized right on the target location. Veeam Agent for Microsoft Windows treats synthetic full backups as regular full backups. As well as any other full backup file, the synthetic full backup file resets the backup chain. All subsequent incremental backup files use the synthetic full backup file as a new starting point. A previously used full backup file and its subsequent incremental backup files remain on the disk. After the last incremental backup file created prior to the synthetic full backup becomes outdated, Veeam Agent for Microsoft Windows automatically deletes the previous backup chain. To learn more, see Retention Policy for Synthetic Full Backups. 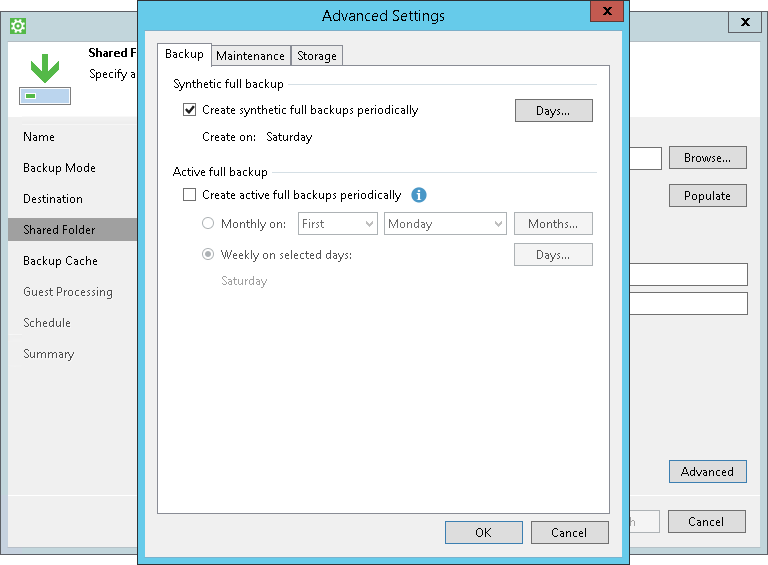 To create synthetic full backups, you must enable the Create synthetic full backups periodically option and schedule creation of synthetic full backups on specific days in the backup job settings. For this reason, if you set up the backup job to create synthetic full backups, in some days there will be more restore points on the disk than specified by retention policy settings. Veeam Agent for Microsoft Windows will remove the full backup chain only after the last incremental backup file in the chain becomes outdated. For example, the retention policy is set to 3 restore points. A full backup file is created on Sunday, incremental backup files are created Monday through Saturday, and synthetic full backup is scheduled on Thursday. Although the retention policy is already breached on Wednesday, the full backup is not deleted. Without the full backup, backup chain would be useless, leaving you without any restore point at all. Veeam Agent for Microsoft Windows will wait for the next full backup file and 2 incremental backup files to be created, and only then will delete the whole previous chain, which will happen on Saturday. Please note that if the backup job is set up to create synthetic full backups, Veeam Agent for Microsoft Windows will never transform the backup chain. Instead, Veeam Agent for Microsoft Windows will always wait for the next full backup file and the necessary number of incremental backup files to be created, and only then will delete the whole previous chain. In the example above, Veeam Agent for Microsoft Windows will delete the previous chain every Saturday. As a result, although the retention policy is set to 3 restore points, the actual number of backup files on the disk will be greater most of the time.